The wait is over...Cisco Webex Calling is here. Assess your technology environment. Choose the best solutions. Implement them to their full potential and maximize their effectiveness so you can operate on a higher level. Managing data kept on-premise is challenging enough. Now, with vital business information residing in private, public, and hybrid cloud environments, monitoring and securing your data is harder than ever. ShoreGroup deploys expert advice and innovative solutions to help you take control of the cloud. Every organization is unique, and determining which solutions, systems, and policies will work for you requires a complete understanding of your IT environment. ShoreGroup begins engagements by developing a 360° view of your on-premise and cloud IT environments, identifying the dependencies, resource utilization, and network impact of every existing application. Selecting a technology provider is a high-stakes decision. If you choose wisely, your business will flourish. If you don’t, you risk falling behind the competition. Don’t fly blind. Leverage our decades of experience to choose the solutions that are best suited to your needs. You’ve selected the perfect solution, now you just have to convince your workforce to use it. When you have hundreds or thousands of employees, that becomes a monumental challenge. ShoreGroup uses training and customization to overcome your users’ old habits in order to truly implement your new tools. Technology is the foundation of modern business. Unfortunately, it’s extremely difficult to replace a foundation. How can you transition to a new software tool, operating procedure, or network infrastructure without interrupting business? Let us guide you through the transition with careful planning and expert execution. 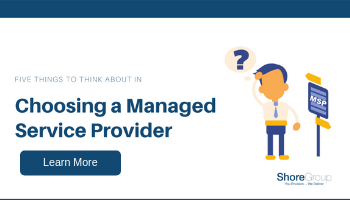 In today’s competitive environment, “If it ain’t broke, don’t fix it” is no longer a viable IT managed services strategy. ShoreGroup goes way beyond break/fix, finding ways to optimize your technology and using best-in-class tools to provide a deeper level of service. In recent years, contact centers have been the subject of a major perspective shift. 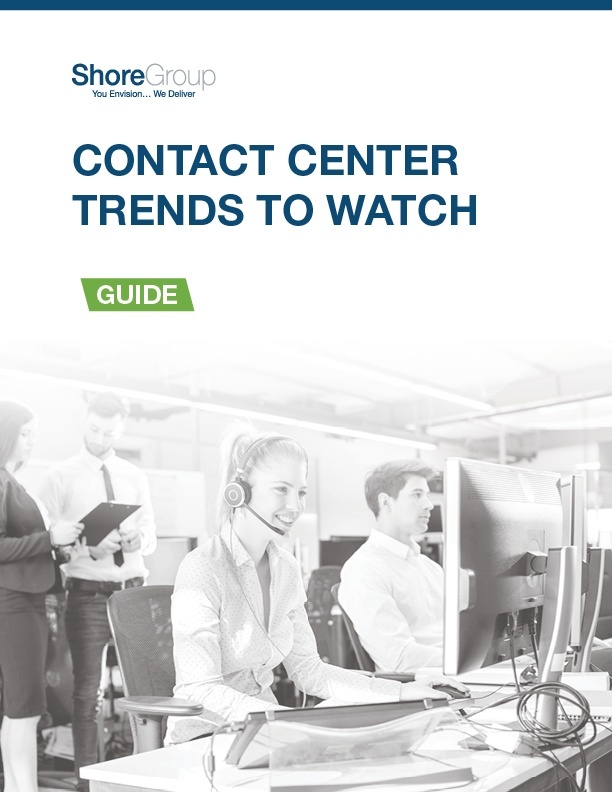 Download our free guide to learn the most important contact center trends, such as prioritizing an omnichannel experience, making use of AI-driven chatbots, and more. Choose the right public, private, or hybrid cloud strategies for your business. Enable employees to work effectively from anywhere with unified communications. Increase the efficiency of your storage and computing and operate on a faster, safer network. Go from cost center to profit center with omni-channel tools. Securely explore the possibilities of a smart, connected infrastructure. Stay one step ahead of security threats and stay out of the headlines. Staying competitive in today’s media landscape means giving your audience constant access to content with no interruptions. ShoreGroup designs and implements future-facing networks and data centers to ensure your media company stays ahead of the pack. With facilities spread out across many locations, it’s easy for patients to feel lost in the crowd. ShoreGroup uses compliant unified communications and omnichannel contact center solutions to help healthcare institutions personalize patient care. Customers expect instant, comprehensive access to their financial information, and they demand their sensitive data to remain secure. ShoreGroup improves communication with financial services customers while consolidating, streamlining, and strengthening crucial data centers. Manufacturers process a tremendous amount of data, and making that data available to workers and customers is vital to success. ShoreGroup connects workers with product information from the top floor to the shop floor, and helps you keep customers in the know with self-service communication solutions. Hearst trusts ShoreGroup because they’re experts at delivering successful projects. They have skilled engineers, very knowledgeable project managers, and the outcomes are always excellent. ShoreGroup did a fantastic job managing multiple projects and helping us meet infrastructure deadlines. Their deep technical know-how and resources helped the project tremendously. Our experts are standing by to help you find the perfect solutions for your technology needs.